EPZ005687 is a potent and selective inhibitor of EZH2 with Ki of 24 nM in a cell-free assay, 50-fold selectivity against EZH1 and 500-fold selectivity against 15 other protein methyltransferases. Representative images of OPCs treated for 72 h with the indicated EZH2 inhibitors. All treatments are at 2 μM. Scale bar, 100 μm. GSK343 is a potent and selective EZH2 inhibitor with IC50 of 4 nM in a cell-free assay, showing 60 fold selectivity against EZH1, and >1000 fold selectivity against other histone methyltransferases. Representative confocal microscopy images of oocytes with DZNep or GSK343 treatment. The oocytes presented with a typical barrel-shaped spindle and well-aligned chromosomes on the metaphase plate not only in DZNep or GSK343 treated group but also in the control group. Spindle was recognized by α-tubulin (green) and DNA was recognized by PI (Propidium iodide, red). Scale bar = 4 μm. Tazemetostat (EPZ-6438) is a potent, and selective EZH2 inhibitor with Ki and IC50 of 2.5 nM and 11 nM in cell-free assays, exhibiting a 35-fold selectivity versus EZH1 and >4,500-fold selectivity relative to 14 other HMTs. EZH2i-induced H3K27ac level change in cancer cells. Cells were treated with 1 mM EPZ-6438 and 1 mM GSK126 for 6 days, respectively. H3K27ac was detected by immunoblotting. Lysates from each cell line were blotted individually. EPZ: EPZ-6438. EBI-2511 is a highly potent and orally active EZH2 inhibitor with an IC50 of 4 nM for EZH2(A667G). 3-deazaneplanocin A (DZNeP)HCl, an analog of adenosine, is a competitive inhibitor of S-adenosylhomocysteine hydrolase with Ki of 50 pM in a cell-free assay. UNC1999 is a potent, orally bioavailable and selective inhibitor of EZH2 and EZH1 with IC50 of 2 nM and 45 nM in cell-free assays, respectively, showing >1000-fold selectivity over a broad range of epigenetic and non-epigenetic targets. Ex vivo growth of the SCLC PDX LX92 is significantly inhibited by the EZH2 inhibitors EPZ-5687, GSK343 and UNC1999 as measured by resazurin conversion (two-way analysis of variance, adjusted for multiple comparisons by the method of Dunnet). JQ-EZ-05 is a specific and reversible EZH1/2 inhibitor. CPI-1205 is an orally available selective inhibitor of the histone lysine methyltransferase EZH2 with IC50 values of 2 nM and 52 nM for EZH2 and EZH1 respectively. It has potential antineoplastic activity. Amodiaquine is a potent, non-competitive inhibitor of histamine N-methyl transferase with estimated Ki of 18.6 nM. It is also used as an antimalarial and anti-inflammatory agent. EPZ011989 is a potent, selective, orally bioavailable EZH2 inhibitor with Ki of <3 nM. PF-06726304 is a selective EZH2 inhibitor with Ki values of 0.7 nM and 3 nM for WT EZH2 and Y641N respectively; also inhibits H3K27me3 with the IC50 value of 15 nM. EZH2 inhibitors EI1 or GSK343 are applied in MDA-MB-231 breast cancer cells with NBAT1 over-expression. The invasion suppression effects of NBAT1 was reversed by concomitant EZH2 inhibitors. 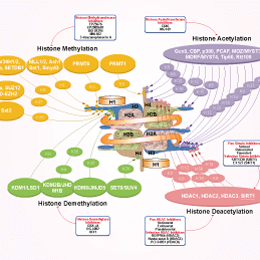 GSK503 is a potent and specific EZH2 methyltransferase inhibitor. LC3B‐II levels are increased following 120 h treatment of GSK503 (G, CRMM1 and CRMM2 at 10 μm, and CM2005.1 at 15 μm) or UNC1999 (U, 6 μm). GSK126 is a potent, highly selective EZH2 methyltransferase inhibitor with IC50 of 9.9 nM, >1000-fold selective for EZH2 over 20 other human methyltransferases. UNC3866 is a potent antagonist of the methyllysine (Kme) reading function of the Polycomb CBX and CDY families of chromodomains. UNC3866 binds the chromodomains of CBX4 and CBX7 most potently, with a K(d) of ∼100 nM for each, and is 6- to 18-fold selective as compared to seven other CBX and CDY chromodomains.